On Thursday, Nov. 17, the Forestry and Wildlife Sciences Building was the setting for an evening of discussion and fellowship between our area’s law enforcement officers and members of the local community. 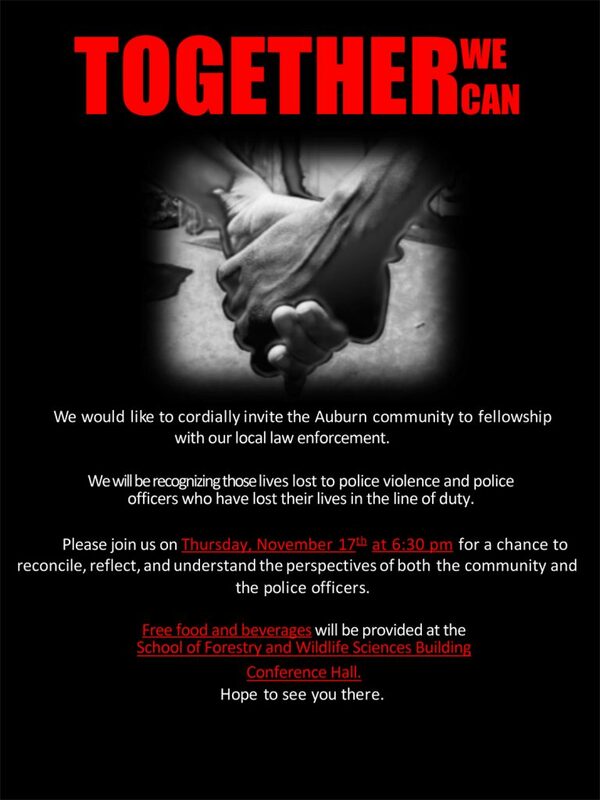 The event, entitled “Together We Can,” recognized those lives lost to police violence, and honored officers who have lost their lives in the line of duty. 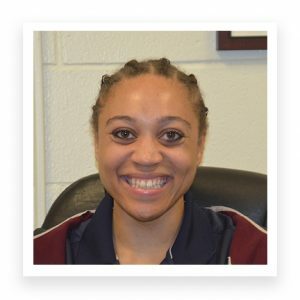 Event coordinator Jade Kinney, who is a doctoral student in the College of Education’s Counseling Psychology program, explained her motivation in coming up with the idea. Kinney acted as moderator for the event, which included a dozen officers from the Auburn and Opelika Police Departments and the Lee County Sheriff’s Office. Allen Sutton, Director of the Cross-Cultural Center for Excellence at Auburn, funded the event. He was unable to attend but sent his regards. Dr. Bobby Woodard, Auburn’s Vice President for Student Affairs, was there. Kinney said he took a leading role, and greeted everyone who came in before making a short welcoming address. Although the event was mainly social in nature, Assistant Chief William Mathews of the Auburn Police Department spent a few minutes addressing the crowd before they broke for food and mingling. He explained that police officers are people, just like the ones they interact with while on duty, and that they seek mutual respect and tolerance. He also thanked Kinney for putting the event together, and said he hopes this will lead to more such discussions and better communication. For her part, Kinney came to Auburn from Lebanon, Ohio, a suburb of Cincinnati. After studying psychology at Loyola of Chicago, she interviewed with the counseling program at Auburn and was accepted. She’s been here 18 months and so far loves what she has seen. She is much less ambiguous about her program, professors, and colleagues. For a brief video of the event, visit www.vimeo.com/193983192.